The brief was to create a creative concept that represented Air BP and could be adaptable for use across future methods of communication. Beach created a visual interpretation of the BP helios from an aeroplane’s contrail in formats for printed, digital and movie formats. An Air BP advertisement sponsoring a British Airways fundraising event was the first project. It incorporated a BA branded aeroplane leaving the helios contrail behind, so combining the two brands. An animated version of the advert was created using aircraft creating the helios contrail, for use on screensavers. 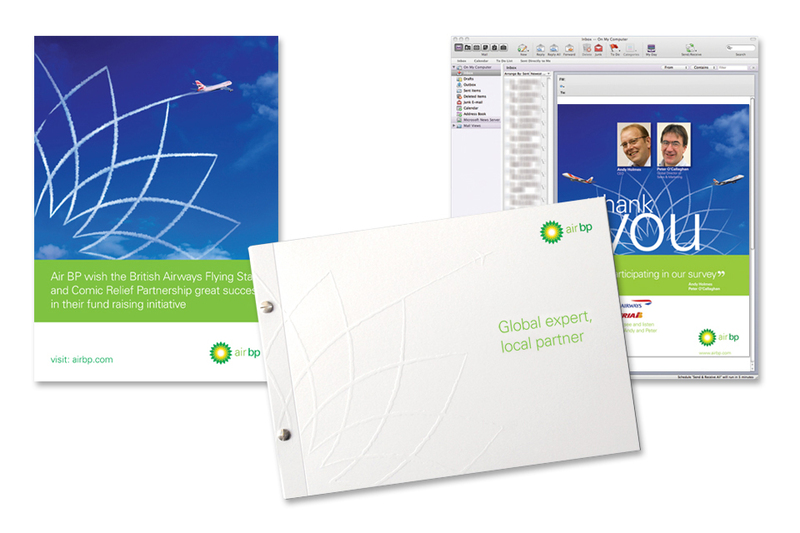 The concept was also incorporated into e-shots sent out to Air BP customers with personal messages from the heads of the organisation, thanking commercial airlines who took part in an Air BP survey. A company brochure was created using a more subtle, embossed version of the creative.